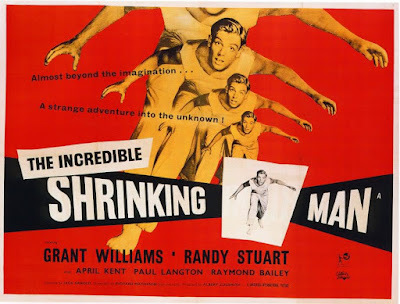 The Incredible Shrinking Man is a 1957 American black-and-white science fiction film from Universal-International and was adapted for the screen by Richard Matheson from his novel, The Shrinking Man. 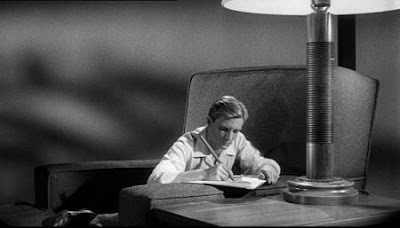 This film together with 20 Million Miles to Earth, Kronos and The Monolith Monsters, all from the same year, left an indelible impression on me for almost six decades. 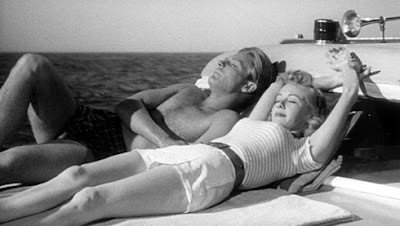 The story begins with Scott Carey, a businessman on vacation with his wife of six years, Louise resting on the bow of his brother Charlie’s boat off the California coast. When Louise goes below deck to get Scott a beer, a strange cloud looms towards the boat and engulfs it. 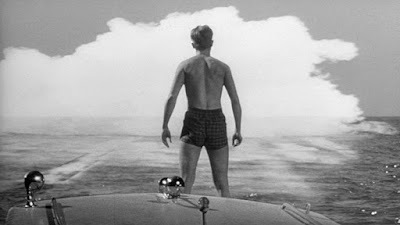 After it passes on, Scott discovers that his bare skin is coated with a peculiar glittering reflective substance. "People just don't get shorter"
One morning six months later, a normally 6 foot 1 inch, 190 pound Scott notices that his shirt and trousers seem to be too big. He puts the cause of the looseness of his clothes down to the laundry service, his losing weight and his wife’s cooking. 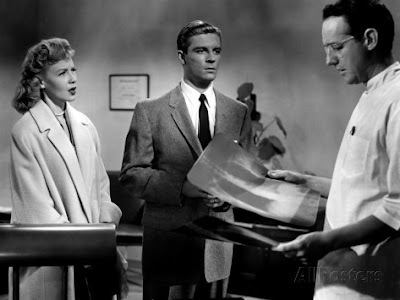 As the problem persists, Scott visits his family physician, Dr. Arthur Bramson and is informed that his height now measures five-feet and eleven inches. Scott tells the doctor, "I've been six foot, one-inch since I was seventeen." The doctor suggests that his weight loss may be the result of overwork and stress. A week later Scott notices his bathrobe doesn't appear to fit him properly. Not only does his robe seem as Shakespeare’s Angus might say, to “hang loose about him, like a giant’s robe / Upon a dwarfish thief,” but also when he and Louise kiss, she no longer needs to stand on tiptoe to kiss him. Scott definitely appears to be getting shorter. However, unlike Macbeth, he is not a thief in possession of what he is not entitled to, but is instead the one who is being systematically robbed of what is rightfully his. We can, therefore, feel sympathy for him. Bound tightly by form and structure. Finally, there is proof that Scott is getting smaller when he returns to see Dr. Bramson who has a series of X-rays taken at different times. By comparing these X-Rays, he is able to show that Scott is indeed getting smaller. In order to uncover the reason behind Scott’s diminishing stature, Dr Bramson refers Scott to the California Medical Research Institute. After more tests are conducted, Dr. Thomas Silver tells Scott that he is losing vital chemical elements of Nitrogen, Calcium and Phosphorus. The doctor discovers something that doesn't belong which he describes as an anti-cancer. The doctor then asks Scott about possible exposure to insecticide. Scott tells him that two months before he had passed a truck on the highway that was spraying trees. Dr Silver then asks him about radioactive exposure. 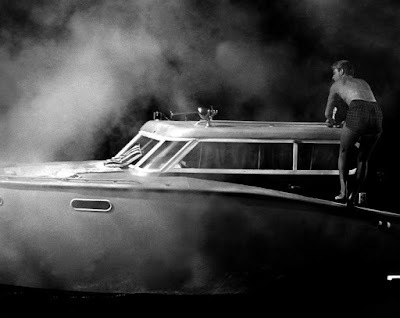 Just as Scott says no, Louise recalls the incident involving the cloud of mist on the boat six months earlier. It is just possible that the two types of exposure had combined to cause Scott’s cells to shrink by rearranging his molecular structure. The implications of Scott’s condition for his and Louise’ marriage is briefly but poignantly highlighted by Scott's wedding ring falling off his ring finger, just before they drive off. As Scott continues to shrink, his story makes it into the newspapers and is now of nation-wide interest. The consequences for Scott are dire: he is unable to drive and has to give up his job working for his brother, Charlie who informs Scott that the loss of a major account means that there are no more pay- checks. Now reduced to being in debt and unemployed, Scott accepts his brother’s advice to sell his story to the newspapers. He also begins keeping a journal of his experiences which he intends to publish. As news of Scott’s condition spreads, his house and privacy is besieged by reporters and curious spectators. Louise contacts the telephone company to request an unlisted phone number but they will have to wait for an unlisted line. Louise soon becomes the recipient of Scott’s misdirected anger as he lashes out at her and the strain is beginning to tell on their marriage. Despite the emotional impact on Louise, she does attempt to reassure her husband that the doctors are working on an anti-toxin. "The anti-toxin, they found it." 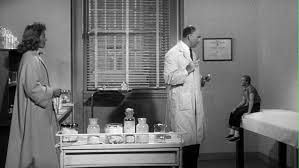 Now at 36½ inches in height and weighing in at 52 pounds, Scott is informed that an antidote has been found for his condition. 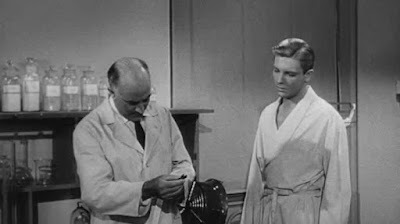 At the Institute, Dr. Silver injects Scott but it turns out that there are no guarantees as to the treatment’s success. In fact, there is only a 50/50 chance and that Scott will never return to his former size unless a cure is found. Scott must now stay at the Institute for a week. The next week it is found that Scott is the same height and weight as the previous week. It seems that the shrinking process has halted. However, re-growing back to Scott’s normal size may not be possible. Scott may therefore have to accept the situation. When yesterday you were 10 feet tall? Or did you get smaller? When you didn’t measure up at work. And still you’ll continue to pay and pay. The meeting with Clarice seems to have helped to improve Scott’s mood and outlook by knowing that perhaps he is not alone and by having his dilemma put into some kind of perspective. Two weeks later, Scott shows Clarice the journal he has resumed working on. 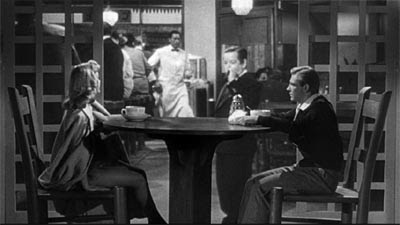 Suddenly he notices that he has become shorter than her indicating that the antidote has stopped working. In a panic, he runs back home which brings an end to his friendship with the one person who can understand his plight and with whom he can share his thoughts and feelings on the matter. In a sense now, he is truly alone. 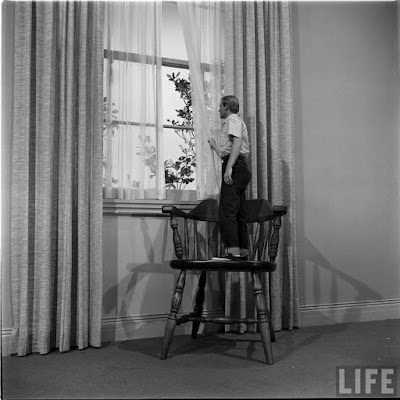 Scott is now small enough (6 inches high) to be living inside a doll house. He is also housed in a private inner abode of bitterness which expresses itself in his tyrannical and demanding behaviour toward Louise and by his inability to end his "wretched existence." When Louise goes shopping, Scott is attacked by his own cat, the very cat he used to enjoy playing with. The beloved family pet sees his former owner merely as a potential meal. Eventually (after playing cat and mouse with the cat…Sorry!) Scott ends up being accidentally trapped in the basement of his home. After returning home, Louise discovers a blood-stained scrap of Scott's clothing. Louise joins the dots and assumes that Butch the cat ate her husband. "From Los Angeles today, a tragic story: The passing of Robert Scott Carey. 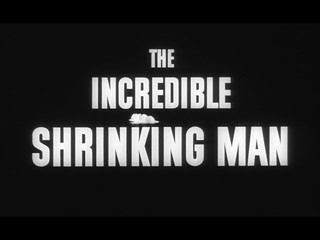 The report of the death of the so-called Shrinking Man comes from his brother. Carey's death was the result of an attack by a common house cat--a former pet in the Carey home." 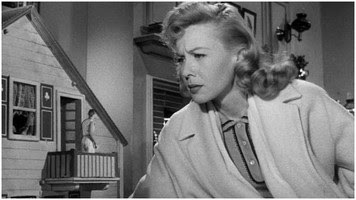 Convinced that her husband is dead, Louise prepares to move. Scott goes quickly into survival mode: Water from a dripping hot water heater. Shelter from a match box. The next requirement, food is more problematic. Without food, the shrinking process will accelerate. Spotting a piece of cheese in a mouse trap, Scott tries to use a nail to spring the trap, but this only results in the cheese rolling into a floor drain. He then sees a lump of stale cake high up off the ground on a bench or shelf attached to the basement wall. His ability to reach it will involve overcoming the obstacle of a rather dangerous looking spider. Scott locates a pin cushion and gets hold of a pin to use as a weapon. 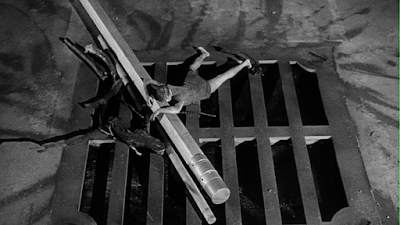 He fashions another pin into a grappling hook which he uses to scale the side of a box. After some effort, Scott reaches the spider’s web which is partially attached to the piece of cake. He uses his pin tool to break off pieces of the stale cake. Scott approaches a vent in the wall but finds that the grid is too small to slip through. 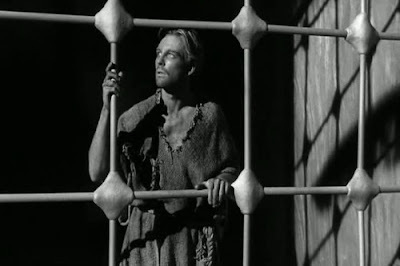 All he can do is lament his predicament of being in “a grey friendless area of space and time." "In my hunt for food, I had become the hunted. This time I survived, but I was no longer alone in my universe. I had an enemy, the most terrifying ever beheld by human eyes." Later on the hot water heater springs a leak that quickly causes the basement to be flooded with a gushing torrent of water. Scott is washed down towards the floor drain as Charlie and Louise enter the basement. He calls out to them but they are unable to hear him. 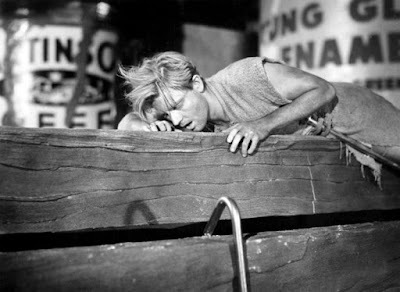 Charlie unclogs the drain, retrieves a trunk and departs the house with Louise, while Scott clings on to a pencil and lapses into unconsciousness over the floor drain. 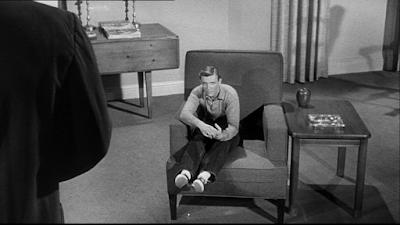 After Scott regains consciousness, he considers his predicament involving his nemesis, the spider. Retrieving his weapons, Scott embarks once again on the odyssey to obtain the cake perched ever so high up the basement wall. Scott’s plan is to use a pair of scissors as a weight attached to a pin by thread. 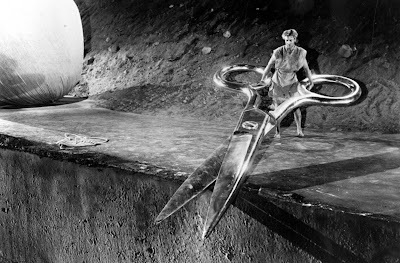 He will use the pin to spear the spider, then push the scissors over the ledge causing the impaled spider to be dragged over the ledge by the scissor’s weight. 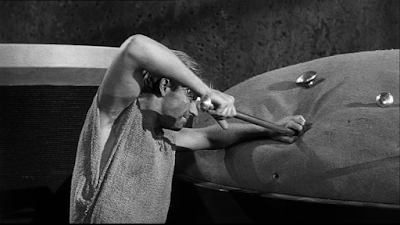 After a couple of harrowing mishaps trying to execute his plan, Scott is able to retrieve one of his pins, plunge it into the spider's body and kill it. Instead of savouring his victory over the spider and celebrating it by claiming and devouring the spoils, Scott drops the piece of cake. The now inch-tall Scott realizes that he no longer feels hunger. 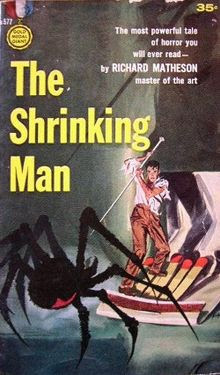 Nor does he fear shrinking. Can I still stand tall like a man? Not knowing who I am? Do I just vanish and slip into an “0”? One that matters – a limitless little man? 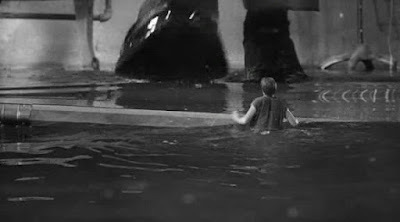 In the flooding of the basement scene, the giant drops of water were simulated by filling up condoms and dropping them by use of a treadmill. No end of uses for the humble condom! Director Jack Arnold added Scott Carey's moving and though-provoking closing soliloquy. 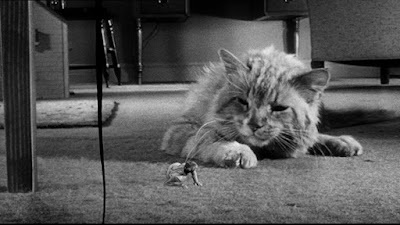 A cat by the name of Orangey played Scott Carey's cat. 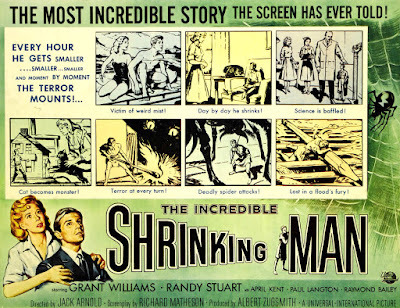 At the completion of the film’s production, studio executives in a rather conventional, mediocre and unimaginative way of thinking wanted to change the ending to a happy one with doctors coming up with a serum to reverse the shrinking process, but director Arnold held his ground and refused. Instead of a neatly packaged resolution, we have a kind of spiritual enlightenment on the part of the main character. 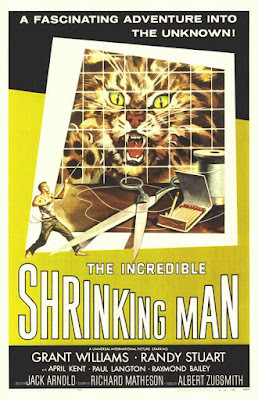 The Incredible Shrinking Man won the first Hugo Award for Best Dramatic Presentation presented by Solacon, the 16th World Science Fiction Convention in Los Angeles. The film was named in 2009 to the National Film Registry by the Library of Congress for being "culturally, historically or aesthetically" significant. 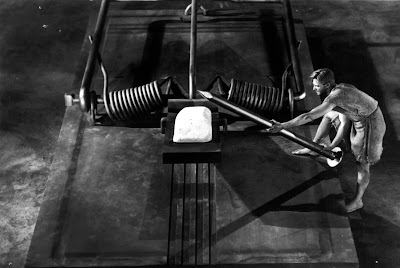 The Incredible Shrinking Man almost stands like a metaphor for much of the human condition particularly in the modern post-industrial context. Scott, like many people find themselves being overwhelmed by fate and circumstances which seem to beyond their control. In the face of world events, geo-politics, the sheer pace of technological change, economic instability, threats to security and privacy and so on, we might very well as individuals experience a sense of powerlessness or of feeling diminished. Do we then resign ourselves to disappearing unnoticed? Do we wallow in self-loathing and self-pity? Or perhaps we might blame and misdirect our anger and frustration toward the rest of humanity and even those closest to us? After experiencing the full range of responses to his dilemma and struggling tooth and nail for existence, Scott is able to literally break out of and transcend the confining prison of his basement-like existence and the kind of negative and destructive thinking and feeling it produced in him. He has managed to truly move on in a spiritual and dignified way via the realisation that everything in the universe, no matter how small or insignificant, has its own worth and importance.